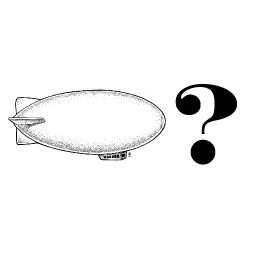 qLab» Blog Archive » the blimps are dead! long live the blimps! the blimps are dead! long live the blimps! my blimps have been offline for more than six months – utterly unacceptable i think. the plan is to relaunch them soon. but first they need a new design. something in sculpties, perhaps. something steam-punk maybe. with one part 20,000 leagues under the sea? perhaps giant flying squids? i leave it to you. and a very low prim count. such things are important when sailing the grid. submissions accepted ’til the end of next month – when a new blimp fleet will be launched. question: what’s up with the primcount? answer: low-prim parcels are the main cause of death for blimps on the mainland. the fewer prims in a blimp the less likely a parcel will kill it. i’d recommend using no more than 10ish prims per blimp – although for an extremely cool design, perhaps more. remember:the blimps are physical vehicles, so they can have no more than 32 prims. hey! send those blimps in! sheesh people – i didn’t get a SINGLE blimp design. Hey Qarl,..did you end up getting a blimp together?